A once-in-a-lifetime event! Celebrate 100 years of Aberdeen Proving Ground's home in the City of Aberdeen, Maryland. 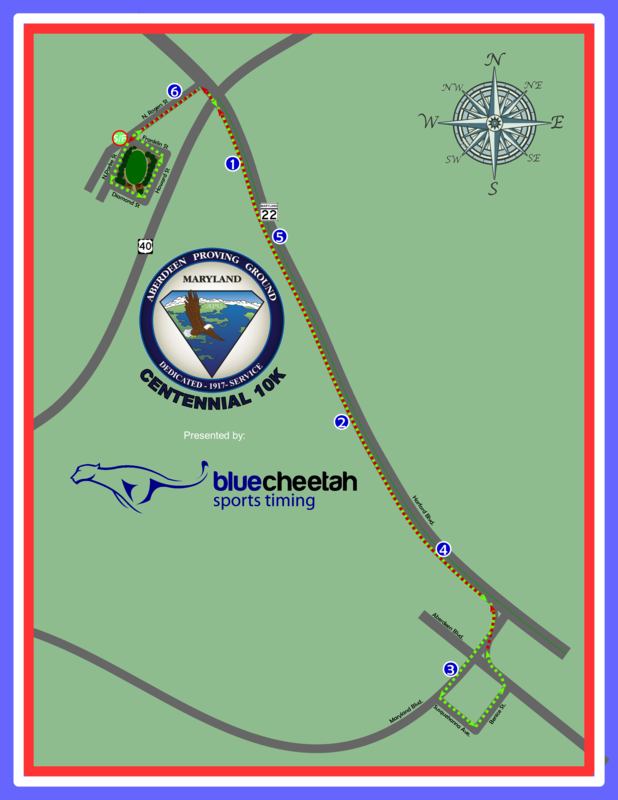 This race will start in Aberdeen's centerpiece, Festival Park, and continue onto Aberdeen Proving Ground, then turn around and leave APG and return to Festival Park for a celebration of this Centennial of Partnership and Cooperation. START TIME: 8:30 AM SHARP! All participants will receive a commemorative shirt (if registered by 9/19/17), race bib, and finisher's medal. We will be providing a bag check at the race start/finish. The planned course will run through the town of Aberdeen and onto Rt. 22, where you will pass through the Rt. 22 Security Checkpoint and complete the "out" portion of the race. A turnaround on APG, then follow the route "back" to Festival Park. The course is mostly flat, except for the Rogers Rd. on-ramp to Rt. 22. This race must be completed by all participants by 11:00 am so that all roads can be re-opened. Please plan accordingly. Awards: Overall Male and Female top finishers and Age Group awards for the following age groups (13 and under, 14-19, 20-29, 30-39, 40-49, 50-59, 60-69 & 70+), first place only. This event is RAIN or SHINE and there are no refunds. Packet pickup will take place on race morning, at Festival Park, starting at 6:30 am. Our paper registration form is available in the pictures. Forms MUST BE POSTMARKED BY WEDNESDAY, 9/27/17 to ensure timely receipt.